Whether we fly frequently or hardly at all, it's easy to forget some of the regulations surrounding specific flights and specific operations. 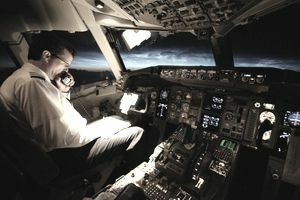 Pilots flying at night are often guilty of forgetting some of the basic regulations surrounding night flight. Here's a quick checklist of FARs to review to make sure you're legal to fly at night, including pilot currency and aircraft equipment requirements. The required takeoffs and landings were performed in an aircraft of the same category, class, and type (if a type rating is required)." FAR 91.151(2) states that "No person may begin a flight in an airplane under VFR conditions unless (considering wind and forecast weather conditions) there is enough fuel to fly to the first point of intended landing and, assuming normal cruising speed… (2) At night, to fly after that for at least 45 minutes." All of the equipment required for day VFR (which some of you may know from the acronym "TOMATOFLAMES") is required for night VFR flight, plus a few extras (some use the acronym FLAPS). Instruments and equipment specified in paragraph (b) of this section. An approved aviation red or aviation white anticollision light system on all U.S.-registered civil aircraft. If the aircraft is operated for hire, one electric landing light. An adequate source of electrical energy for all installed electrical and radio equipment. One spare set of fuses, or three spare fuses of each kind required, that are accessible to the pilot in flight.